I take several road trips a year from the US into Canada with my dogs. 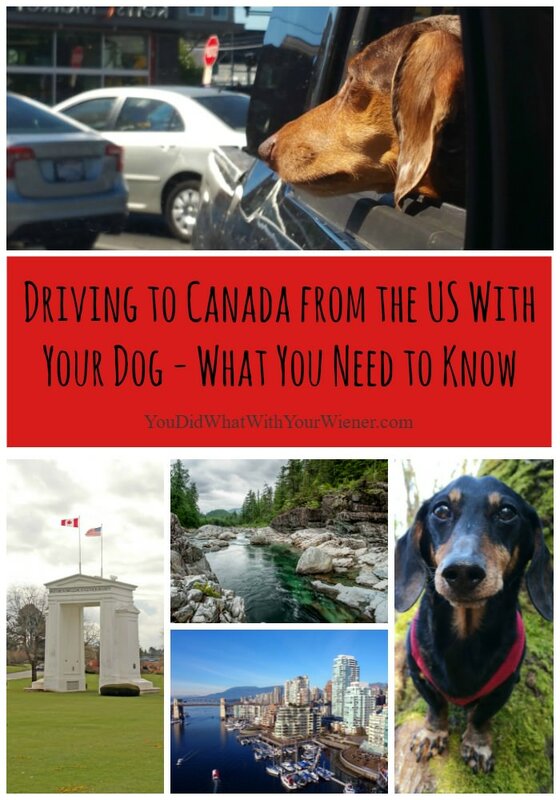 People know I like to travel to Canada so they often ask me questions like “Can I take my dog to Canada?”, “How hard is it to cross the US-Canadian border with my dog?”, and “What rules do I need to follow when crossing the border with my dog?”. I’m always happy to share what I know based on research and experience. Can I Take My Dog to Canada? The short answer is YES. In most cases anyway. With the right paperwork, and appropriate vaccinations, most dogs can travel to Canada from US in a car. Note: There are a couple of nuances about the 30-day rabies period. 1) This 30-day waiting period is based off the US requirement. Dogs can enter into Canada even if has been less than 30 days between their rabies shot but US requirements say that dogs that have never been vaccinated against rabies must be vaccinated at least 30 days before arrival. Adult dogs older than 15 months of age, that previously received a rabies vaccination given no earlier than 3 months of age and that has since expired, may be imported immediately after booster vaccination, without the need to wait 30 days. Making sure it’s been 30 days between the rabies vaccine and travel either way is the surest way to make sure you and your dog don’t run into any trouble. 2) Assistance and service dogs can ENTER CANADA without any paperwork, including proof of vaccinations, if the dog is traveling to Canada with the owner. Service dogs traveling alone or with other people into Canada are subject to the same regulations as non-service dogs. Assistance and service dogs traveling BACK INTO THE US DO need proof of rabies vaccination. Are the Rules the Same for My Puppy? For puppies younger than three months of age, vaccinations or proof of a vaccination is not necessary TO GET INTO CANADA. However, as listed above, the requirement to return to the US is still 30 days before entry. If you plan to stay in Canada for longer than 30 days, and plan to visit a veterinarian for a Rabies vaccination at least 30 days before your planned return to the US, you can take your puppy into Canada without the vaccination. For more details on the process of crossing the border with a puppy read What Every Dog Owner Ought to Know About the Canada/US Border Crossing from our friend Montecristo Travels. If you plan to cross US-Canadian border, you will need paperwork proving that your dog has had a rabies vaccination. This paperwork should list your licensed veterinary clinic, the trade name, date, and expiration date of the vaccination, and contain your vet’s signature. The rabies certificate must also include the owner’s name (your name) and a description of your pet (breed, color, and weight). Be aware of the timing requirements. When you are entering Canada, there is no required waiting period between the time the animal is vaccinated for rabies and the time the animal is imported into Canada. However, entry into the US requires that your dog had a rabies vaccination at least 30 days prior. I’ve done some research on what kind of food and treats you can’t cross the border with. It’s a little confusing because even the regulatory documents seem to contradict themselves sometimes. To be safe, you should probably not try to bring things containing beef into BC, Canada (I am not sure about other parts of Canada). You can’t bring pet food and treats containing lamb or goat into the U.S unless the label on bag or can shows US origin. The bottom line is to make sure all food and treats are in their original packages, which lists the ingredients and sources, and be prepared to leave any items deemed to be prohibited in the custom’s trash can. For more details about bringing food and treats across the border, read Traveling With a Pet Dog Between the US and Canada: The Fine Print from our friends at DogJaunt. It can be nerve-wracking driving across the Canadian-US border if you don’t do it often. The border guards rarely smile and ask a ton of questions that sometimes seem irrelevant. The questions we always get asked are where are you from? What is the purpose of your trip? how long will you be staying? Where are you staying (including address)? We also often get asked small details about where we are going or an event we are traveling to Canada for. I am pretty sure making you nervous and asking details is a way of determining whether you are lying or not. I’m not sure if it is true but I have heard that the guards are trained to make you nervous on purpose because a normal, honest person will get nervous but someone with less than good intentions will act “strange” – either sweating bullets or playing to too cool. Traveling across the border has been really easy for us. I proudly waived my paperwork for Chester and Gretel our first time across but the border guard did not ask to see it. I have never been asked about treats or food I am bringing across the border either. Although it’s rare, I have heard of people asked to pull aside for an inspection by border guards though. You can see a transcript of an actual conversation our friends at GoPetFriendly had with a border agent here to get another perspective on crossing the border. Taking Your Dog to Canada from the folks at GoPetFriendly. This article has more information about border crossing paperwork requirements for humans as well as a “special warning” if traveling to Ontario. 10 Tips for Adventure Road Tripping with Your Dog by yours truly. I talk list some things to consider when traveling log distances with your dog in the car and searching for dog friendly hiking trails. Have you traveled across the US-Canadian border with pets? Do you have any tips or stories you can share? Great article! I am sharing this for sure! Thanks for the info. We are driving through Canada to Alaska and back and this has answered our questions. Glad you found it helpful. Have fun on your trip. how did it go traveling with your dog through canada to alaska then back through to the contiguous states for you? I am moving from Alabama to Alaska next week. I plan on taking my 15 lb shih Tzu mix dog with me. I will be driving, so I will cross the border into Canada and then again into Alaska. He is 4 years old and had his yearly shots and rabies vaccine just a few months ago. So, will I only need that proof of vaccination for both crossings? He is very temperamental and hates strangers, so I worry about border agents thinking he’s aggressive and violent when he actually is not. I also don’t want him to be quarantined because he wouldn’t do well, again, because he hates strangers. Would you mind letting me know what all I should be aware of and need to take with me regarding him for the border crossings? Thanks!! Hi Kaylin. I am not an expert on driving to Canada and back with dogs. I’ve done it a few times from Washington to BC and back and put everything I know into this article. I also liked to some articles written by people who know more about crossing the border with a dog than I. That being said, I would imagine crossing into Canada then to Alaska (back into the US) isn’t any different than the US-Canada-US trips I’ve taken. Proof of vaccination (especially rabies) should be all you need. How much “hassle” you get at the border is up to the particular border guard. They could require some sort of inspection but likely wouldn’t. Although I have the vaccinations records with me, I’ve only been asked for the papers once in the 5 times I’ve crossed the border. If there is an inspection, I’ve never heard of one where they inspect the actual dog. It’s usually the car when they do an inspection. Amnyway, good luck. As long as you have the papers, you shouldn’t have any issues. Was there any issue coming back into the US? Does the US have requirements to bring the dog back in even if he originated there? Im Canadian but my husband and I live in Virgina. We just got our weiner puppy and are looking forward to taking him across the border to see his “Grandma” and her weiner dog! Hello. The information I listed applies to crossing the border in either direction but is primarily written from the perspective from living in the US and traveling to Canada and back (since we live in the US). I noted where there were any differences, like with the rabies vaccination waiting period. Please let me know if you have a different or more specific question though. We traveled across the border and back again this last weekend. No one even asked me anything about my dog. We’ve crossed at least a dozen times now and no one has. One person asked if I had paperwork but didn’t want to see it. I would always make sure you have the required paperwork but don’t be nervous – crossing the border with a dog is easy. Any fees associated with crossing the border with the dog in either direction? No. There is no fee to cross the border. You do need a proof of rabies vaccination though. Your vet should give you one of those free I think but some may charge. Hi Kimberly. I can’t make any promises as I am not an expert but my interpretation is that what you have in enough. There are probably more mixed breeds crossing the border than purebreds. The border inspectors/guards just need enough info so they can tell that the certificate is for that particular dog. You didn’t mention this so as a reminder make sure that the certificate is signed by your vet. Great page Jessica! I couldn’t believe it was you when I saw your picture posted! You are so amazing. We are headed to Canada sometime in the near future and want to take our dog. ???? Looking forward to meeting you! Our paths keep crossing so let’s meet sometime soon!!!! This is great information, thank you for posting it! I have a know 4-5 month old Australian blue heeler mix, and I want to go up this summer to Canada to visit a friend and was concerned as to what to do with Roy. I’m happy to see that with proper paper work he can come with me making it a great trip as he loves riding in the car! 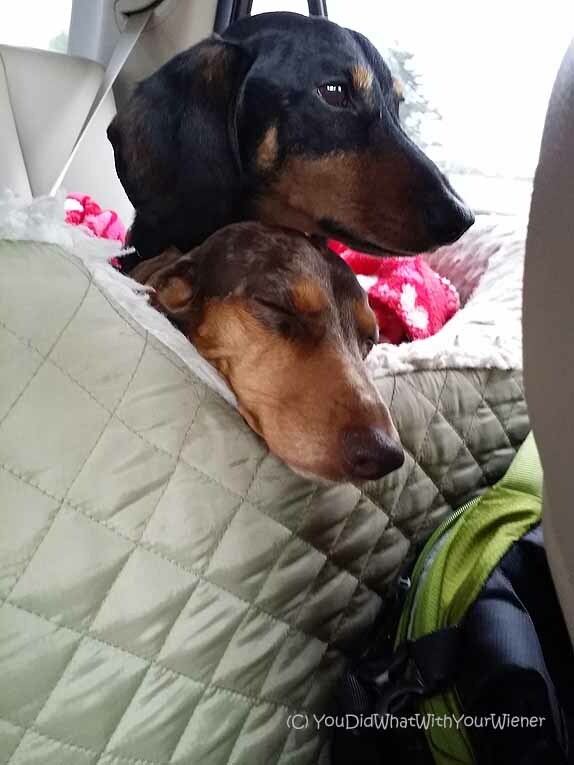 We normally travel with 4 dogs, (all under 10 lbs) in our Motor Home. Are we able to take all 4 into Canada, with proper papers? Hi Lynn. I have not heard of any restrictions on the number of domestic pets you can take but I really don’t know much about that as I only have 2. I could see where some government agencies may consider “a lot” of animals to be transportation of “animals” and have different rules? I’m not sure. I did ask my dog-owning friend who lives in BC and she said there shouldn’t be a problem with 4 dogs. However, you need to have the records I list in this article for each one of them. Hi Jessica! Thank you for such valuable information! How many days before the trip did you visit veterinary to receive the paper about vaccination? Do you know, are there any rules about “”freshness” of this paper? Or may be you use the same paper during the year until the vaccination expires? Hi Mila. I did get a new vaccination proof a couple weeks before because my old one was tattered. As long as you have proof of vaccination expiration, it shouldn’t matter when you received the paperwork. I’m sure they prefer it’s clean and crisp though. I keep the records folded up in my passport so they are handy and protected. I have a mixed breed dog. I don’t think he is a pit mix but now I am scared. Does BC have any kind of breed ban that I need to worry about when traveling there? I can’t find and info stating so online but wad wondering if you knew. Hi Karissa. I don’t. I’m not aware of any restrictions but I will ask my Canadian friend and let you know if she gets back to me. 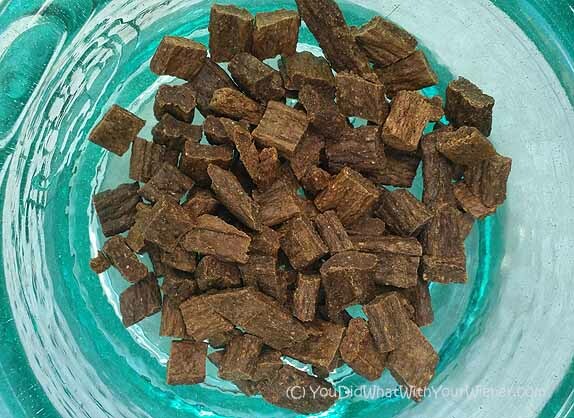 Interesting about the food – my GSD has food issues and can literally only eat beef food from one rare brand… anything else, even slowly introduced gives him liquid poo… at a VERY rapid pace. Especially chicken. He is very limited in his treats… on road trips he gets blueberry donuts (I know they aren’t great – so it’s pretty rare for him). He can have some Mac n Cheese, and he can have some veggies… but only one type of dog food. I’m planning a coastal roadtrip from Canada 🇨🇦 to Southern California 🇺🇸 this summer and was curious about border crossing w/ dogs. Thanks so much for this informative article & helpful links! Great info and very clear Thank you so much for putting this out there….. I am having my best friend care for my little guy up in BC while I go to Norway is to long of a flight for him so he can’t go with me and I was looking up info this is who I came across your blog 🙂 just what I need to know !!! Hi Gisela. That sounds like a great trip! I’m glad you found someone you can trust to watch your pup and I’m glad my article helped you in regard to crossing the border. Thinking about adopting a six weeks old puppy in Alaska but, upon reading everything I am not sure that I can cross the border. She is up to date on her shots but can’t have her rabies yet. We have to cross the border from Alaska to Canada and then back to the US. Will you be flying or driving (I assume driving by your comment)? I am not sure that it would matter if you fly because you are flying from US (Alaska) to US. If you drive through Canada though, you will have to follow rabies requirements for entry into Canada and than again when you reenter the US. Both of those are from sources I really trust. It looks like you will be ok to cross but that will be a quarantine period when you come back into the US. The information in the first link above suggests you call the CDC ahead of time and work things out with them but the comment above makes it sound like the agreement is something you can sign at the border. Whatever you decide to do, good luck. I bet you’re excited about your new puppy.